Rollin H. Person was born on October 15, 1850, on a farm in Iosco, Michigan. He attended the country school of his neighborhood and the high school at Howell. He studied for six months in the Law Department of the University of Michigan. In 1871, Person became an assistant to his uncle, who was Registrar of Deeds. In 1873, Person was admitted to the Bar of Livingston County and soon after was married to Ida M. Madden. Shortly after their marriage, the Persons attempted to find their fortune, in “far western territory.” They settled in Nebraska and Person began to practice law, but the plagues of that frontier soon made him long for his old home. They returned to Michigan in 1875, resuming the practice of law in Howell. When the Thirtieth Judicial Circuit was created in 1891, Person was appointed by Governor Edwin Winans to the vacant judgeship and served by subsequent election until December 31, 1899, when he voluntarily retired to practice law in Lansing. 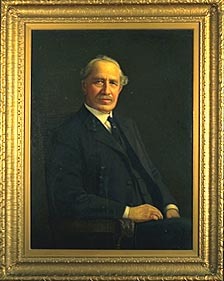 In 1915, he was appointed a Justice of the Michigan Supreme Court to fill the vacancy created by the death of Aaron McAlvay. He remained a member of the Michigan Supreme Court until January 1, 1917, when he resumed the practice of law in Lansing, as a member of the firm of Person, Thomas, Shields & Silsbee. In contrast to his conservative legal disposition, his political, social, and religious views were liberal to the point of radicalism. He was always ready and open to study any new or radical ideas, and always disposed to discuss and adopt any and all that appealed to his speculative disposition, never allowing his thoughts to be hampered by tradition or established notions.